I've gone through so many wetsuits in my life its crazy! From xcel, sporasub, effesub, picasso, I've tried them all. I have 1 mil, 1.5 mil, 2 mil, 3 mil, 5 mil suits in a variety of colors from blue, red, purple, black colors (no pink). 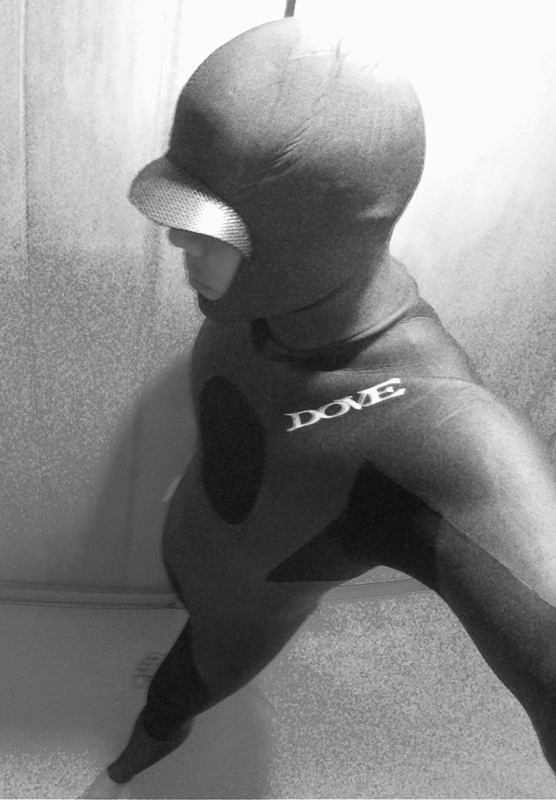 Some of my friends are team riders for this Japan Brand Wetsuit called "Dove Wetsuits" and told me how awesome it was! Custom wetsuit with warmth and comfort. Well my wetsuit arrived yesterday via Japan delivery service and I feel honored and humbled to wear it. It felt so comfortable I wanted to sleep in it last night but decided to save it for my next dive. I felt like a kid on Christmas day! Thanks Tokura-san, Takami, Toda, Kirby, and Hayato for making my Dove Dreams come true! I can't wait to test out this "dream wetsuit". See www.dovewet.com to order your dream wetsuit today! Today plan was to help catch fish for a Go-Naminori party! 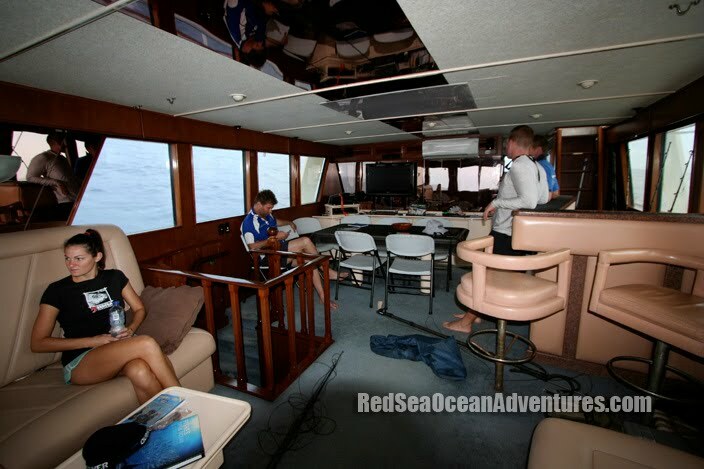 Divers Travis, Kirby, and Hayato boarded the Red Sea boat for a hard day of diving. Don't these guys work or what? The forecast was for light winds today and thats what we had. Not even a ripple as we headed out toward the channel. 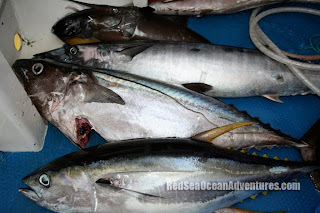 We worked for Ono's today unloading loads of palu "chum" but they were no where to be seen. There were lots of humpback whales, sharks, squid, yes calamari school came by and we took some out. Then Kirby nailed this 25+ lb. 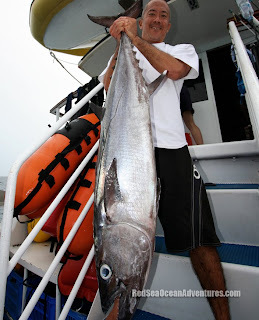 hawaiian hamachi "kahala" which may be cooked up for the party. Thank God it's Tuesday...Well tomorrow's Wednesday so time to hit the pavement and get some work done! Forecast looks like trades are on the rebound for a few days then it will back off again for this weekend. lots of surf on the northshore so plan your days accordingly. Coral Sea Trip 2011 just finished and luckily we had some blue sky despite the major floods that occurred south Queensland. Our divers met up with legendary Aussies Rob Torelli and Andy Ruddock who took us out for an adventure of a lifetime. The boat we chartered was 5-star all the way! Captain Pete and his crew Kate, Oscar, and Kevin did a superb job caring for us all on board the luxurious 60 ft Phoenix. Lots of room, flat screen tv, a/c, good food made our journey so much easier. 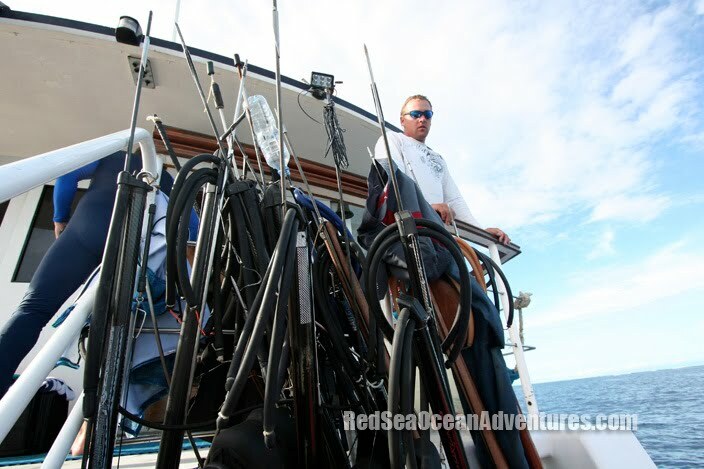 I think we had enough spearguns to catch anything we wanted. The challenge was being able to stone your catch amidst the many sharks. Our target species were pelagics and the boys did well in providing fresh sashimi everyday. 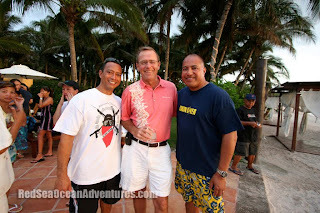 There was lots of reef action as well and we were able to film a 3 pronging segment. I was able to get a lucky shot off one dogtooth. This was one of the smaller ones taken, but good enough for me. We got some great footage to come on a future episode of Hawaii Skin Diver Television. Stay tuned for more photos and stories to come...time to unpack! Hola Everyone! Tonight at 8:30 pm. premiers our new Hawaii Skin Diver Episode, featuring Wendell Ko (left) and Ernie Ripley (right) as they experience the Punta Mita Lifestyle! 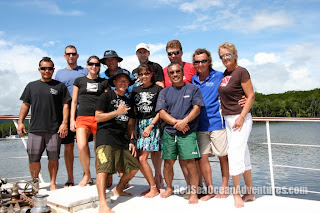 Greg Stanton (Center), Steve Dunn, Emma Perez Castillo, and their crew from Punta Mita Resorts were so gracious and hospitable that our divers did not want to leave. They toured around Salyulita and ate their best burrito ever! Visited the fabulous 4 seasons and St. Regis Hotels and experienced first hand luxury villas! 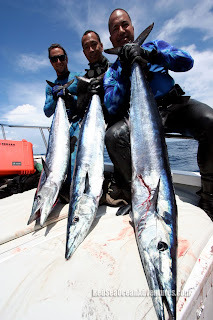 They dove with Sebastian Melani from Punta Mita Expeditions and Ernie was able to land his first Wahoo of his life! For those of you not living in Hawaii, Log on to www.oc16.tv to watch it online every time it airs in Hawaii. Click: http://redseaoceanadventures.com/hsdtv/ for showtimes. We hope you enjoy the show!